I loved when I had business cards. I felt very special and important handing them out at networking events, or even more cheeky, to suiters who requested my digits. But I remember taking a peek at the marketing invoice and seeing just how expensive all the letterhead, business cards, brochures, etc. were for the company to print out. Luckily, there are sites like PrintingWatch, which helps businesses find the best deals on printing services, so you can spend your marketing budget on more important things like team-building events at the pub, for example. When you click on the top printing offers, for example business cards, you’re taken to the list of printing companies offering discounted services along with the customer ratings, dimensions and price listings. You can also sort your search results by recommended, shipping, and pricing. It looks like Printing For Less is the recommended business card-making service. Just a little FYI. The site also has a section with the most recent printing deals that customers should watch. Click on a deal and you’re taken directly to the printing company’s site. 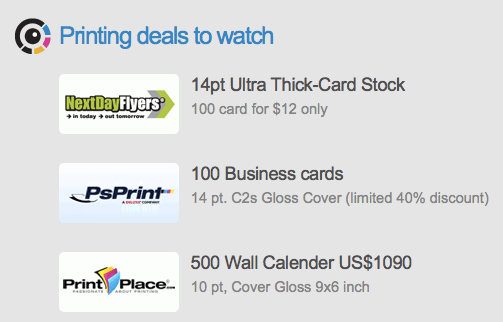 Looks like Next Day Flyers is offering 100 business cards for only $12. Bargain. Who knew a printing deal site could be so inspiring? If you’re a company trying to tediously look for the best printing prices online, don’t waste your time. PrintingWatch has done the legwork for you. All the best printing deals, all in one place. I love sites like that. 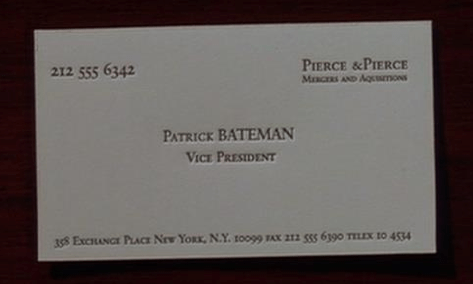 And, I bet our favorite American Psycho, Mr. Bateman would appreciate the site too.